Barsha is going back to school this month with wines from all over the world. From Germany to Chile and everything in between we will teach your taste buds to enjoy some new wines that may be new to you! So grab your paper and pens and get ready to take some notes, or should we say… some wine notes! It’s Back to School this month at Barsha! Vacations are coming to an end, the kids are back in school and fall is slowly creeping up on us. Our Classico members will enjoy a German white wine that will transition you into the fall, but is still very refreshing for the Autumn heat in the South Bay. The red is a Grenache and Mourvedre blend from the Rhone Valley that is elegant yet bold with notes of fruit and pepper. Riserva club is going to be receiving a Sancerre that is the perfect combination of fruit and acidity and for the red, a Carmenere from Chile that has a long, lingering finish. At the Wirsching Estate, the Silvaner is one of the most important grape varieties. In great years, the wine surprises with a playfulness and elegance that is unmatched. Thanks to its unobtrusive nature, it is ideally suited as a companion for many, many foods, both as a simple table wine with a light cold meal or as a noble wine for fine dining. The ideal companion for any menu.This Silvaner has a vital character. It’s fresh bouquet shows fine fruity notes and its youthful lightness is remarkable. The light acidity and mineral taste, which are so typical for our wines are wonderfully nuanced. Domaine la Collière stands out in Rasteau as a proponent of a more elegant style of wine. While others pursue concentration and density to tame this wild terroir, Georges and Delphine Perrot try to avoid over-extraction so as to promote aromatics, reduce harsh tannins and reframe the power of the terroir with freshness.The Rasteau la Fontaine is the most muscular cuvée made at Domaine la Collière. A blend of Grenache and Mourvedre, La Fontaine is sourced entirely from blue clay soils. The 2013 La Fontaine is a beautiful wine with aromas of raspberry, spice, herbs, and hints of stone. Fruit and pepper accents hit the palate as this lively, fresh offering unfolds. Perfect for pizza, spicy meat dishes or red pasta sauces, this wine will sing with almost all meat-inspired dishes. The 2013 vintage of Koyle Royale Carmenere has dark purple color, with pure clean “wild forest” aromas, and a vivid array of black cacao, intense spiciness and some orange peel notes. On the palate, it is firm and balanced. The tannins are silky and rounded and it ends in a long, lingering finish that is influenced by the addition of Petit Verdot into the final blend. This wine is ideally served with red meats, ripe cheeses, and hearty dishes. September Cheese & Charcuterie Club! Loaded with New Mexican Hatch Chiles, Red Butte Hatch Chile is proving to be one of their most popular cheeses among fans. They mix spicy chilies into the cheese which are then pressed into the curd. Their signature rub contains dried chiles and spices which bring out floral and savory notes in the base cheese. Beginning in 2018, Beehive Cheese Company will donate 3% of the gross sales of Red Butte Hatch Chile cheese to Red Butte Garden to further their efforts to maintain a place where nature and people connect. Made from the rear haunches of the pig, this Dry Cured Ham is carefully cured over 14 months with just enough salt to preserve it while also allowing the meat to remain tender and sweet to the taste. 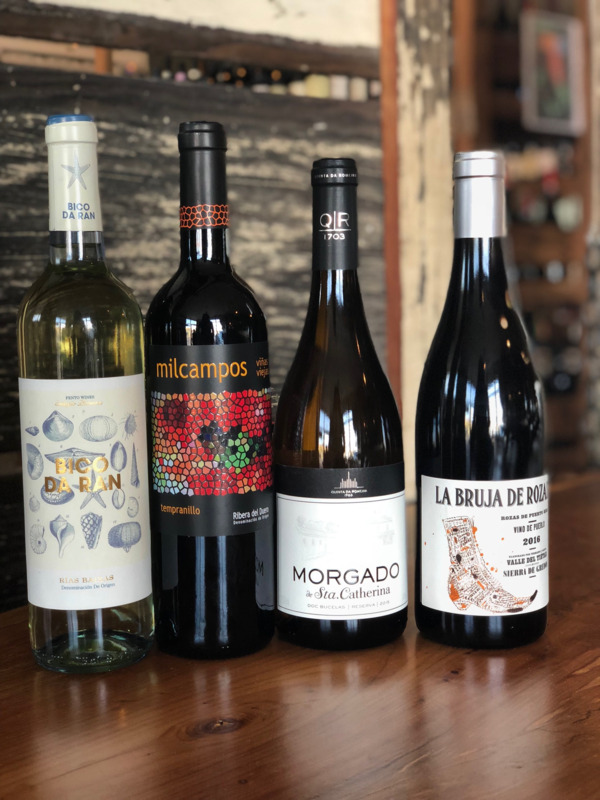 We would recommend a light-bodied dry white wine with a light, crisp, refreshing taste or a light to medium-bodied red wine with a hint of earthy aromas balanced by a fruit-forward bouquet. Enjoy at room temperature on its own or serve on a charcuterie board with saucisson, cheese, melon and baguette. These small batch homemade jams are made locally by Chef Scott in Santa Monica. Autumn Apple is made with apples, cane sugar, cinnamon, lemon, ginger and cloves... a perfect taste of Fall and a delicious pairing with the Red Butte Hatch Chili. 1/2 off of Pete Halvorsen Prints for all wine club members for the month of September! Come in to check out his awesome photography around the store!